The Christmas jammie selection has left much to be desired this season, at least for the boys. I spent way (waaayy) too much time trying to find something that spoke to my Christmas loving heart, just to end up purchasing the standard Hanna Anderson fair isle. You can never go wrong with fair isle (even though, again, not the best fair isle compared to Christmases past)! The runner up option was this Wintry Night set. So while the Christmas jammies were a big womp womp, Old Navy is absolutely killing it with their regular pajama selection!!! I kid you not, I have purchased every single one of these prints for at least one of my boys, some even in a size up simply because we do not need more pajamas currently. They are all just too cute to pass up! Hi, my name is Laura, and I am currently hoarding pajamas. We got those Hanna pjs too (as well as a train pair). But I also picked up so many other Christmas pairs too... I seriously think I need to join one of those anonymous groups since I really do have a problem! I'm loving pjs in general these days! I might have to let Noah wear them during the day just to get enough use out of them ;). Lil jams on lil kids are sooooo cute. I really love the wintry night ones! Festive pajamas are one of the best parts of the holiday season!! These are all adorable! Pajama's on littles is the best thing ever. I'm obsessed. Those teepee ones are adorable. Loving Old Navy's baby boy stuff lately! And I agree. I'm having a hard time finding cute Christmas PJs! I feel the same way about pj's!! I'm addicted. And when they match, even better!! I went with the standard red and white striped H.A. ones this year...there are more "winter scene" ones that I like but needed the Christmas-y ones! I'm having a hard time with girl holiday jammies too! Not much out there I like this year and I usually have them for the year by now! Yep, we bought the same Hanna jams this year too! Agree about the other options, like from GAP kids. I'm not a fan of the Christmas skeleton PJs with the gingerbread men in the tummy -- like, ...what?! I do think the Brannon line is pretty cute, but that's it. 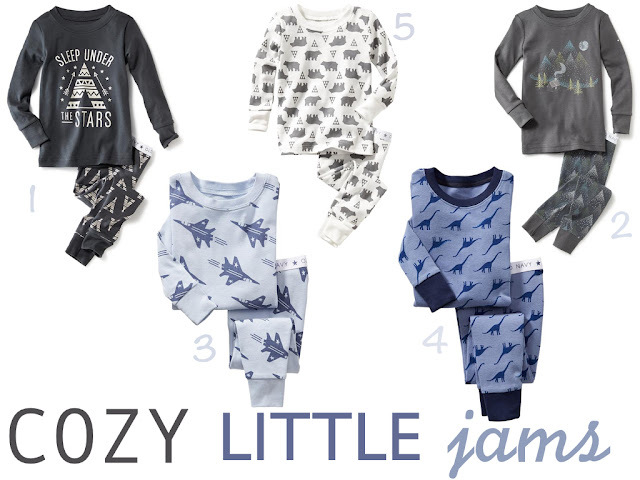 I've been loving some of Old Navy's jammies too, just need to pull the trigger on some MATCHING pairs too. :) Can't wait to see the boys decked out.